FCI # 254, Origin: Austria, Group 6.2 Scenthounds. Grooming: Medium, Shedding: Medium, Coat: Weather resistant double coat. Color: Dark red, black with red markings (small white markings on the chest are allowed). Breed: The Alpine Dachsbracke by many??researchers? ?is named an ancestor of Dachshunds, from the other hand, some scientists believe, that this dog was bred by crossing Dachshunds with some large dogs. It is not excluded that in the crosses were participating the long-legged Bracke, as evidenced by the fact that in one litter of Alpine Dachsbracke are sometimes born relatively large puppies (up to 42 cm at the withers). Definetely, the Alpine Dachsbracke is a breed, closely related to the Swedish Dachsbracke (another name of the breed - Drever), and many authors combine them, believing that this two are closely related. There are three types of the Dachsbracke: Westphalian Dachsbracke, the Dachsbracke from the mountain Harz and the Alpine Dachsbracke, the first breed, the smallest of them all, almost completely disappeared. The dog is covered with dense, rather short coat and by the shape of the body is very similar to a Dachshund. 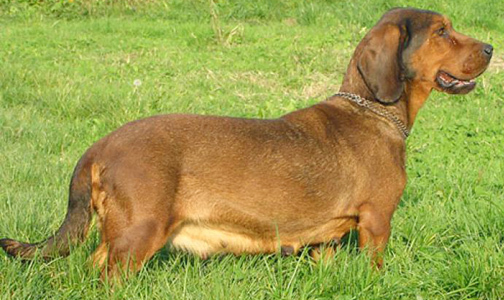 In Great Britain the breeding of the Dachsbracke started approximately in 1949. In Germany this breed was legalized in 1896. The Dachsbracke is the common name of two original breeds of hounds: Westphalian and Alpine (Austrian) Dachsbracke. In the comparison with the long-legged hounds, the Alpine Dachsbracke has the advantage of their short legs - that's why they are going on the trail much slower. Therefore, the animal does not run in front of them too fast and too far. The Dachsbracke is a transitional form between a Dachshund and a high-legged hounds. He has excellent hunting qualities, and with great success is used for both - for chasing the game, and for working on a blood trail. In some countries, where the Alpine Dachsbracke are used for hunting purposes only in isolated cases, the representatives of this breed are relatively rare. In 1896, for mountain hunting dogs that were the pride of their owners in the Bavarian highlands, there was approved the single name, that united them in a "family" ? ?- the Dachsbracke. They are some sort of a transitional form between the Dachshunds and the long-legged Bracke and in their formation were primarily participating the small Bracke. 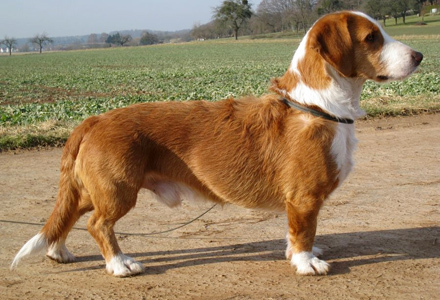 Unfortunately, the relatively smaller piebald Westphalian Dachsbracke with height at withers 30-35 cm is now almost completely disappeared, while the Alpine Dachsbracke, with his coat colored black and tan, brown and red color, height at withers of 34 to 42 cm, we can meet quite often. In 1881 and 1885 the Alpine Dachsbracke accompanied the blood Prince Rudolf of Habsburg in his hunting trips to Egypt and Turkey.
? ?In 1932 the Alpine Dachsbracke was??officially??recognized?? the General Canine Organization in Austria. This was the third breed of scent hounds registered in Austria. In 1975 Alpine Dachsbracke was recognized by FCI, the country of origin was declared Austria. General Features: The Alpine Dachbracke is a hardy, active, hunting dog, adapted to the difficulties and physical strain. Average growth. The breed is characterized by: a muscular body, a well pronounced withers, straight back, broad loin, well-developed brisket, tail of a medium length with a "brush", medium-sized paws, moderately elongated neck, a long head with a flat forehead, medium-high set ears, wide nose. The head of the Alpine Dachsbracke is long with a flat forehead and a smooth transition to the muzzle, back of the nose is straight or at the end little bit omitted, slightly pointed. Nose is moderately broad. Pincer bite with powerful teeth. Lips are thin, tight to the teeth, slightly drooping. In the corner of Alpine Dachsbracke's mouth noticeably appears thickened lower lip. Ears are medium in length, hanging, wide, with bluntly rounded ends, set high, smooth and dense without eversion hanging over head. In the excited condition slightly raised. Eyes are of medium size, round, color depending on a coat - light or dark brown. Temperament: Dogs of this breed are great fro hunting the hare, fox, deer and a wild boar. They can also be used as a retrievers. The difficult terrain is not an obstacle for the Alpine Dachsbracke, this dogs are energetic and tireless in the mountains. Wonderful scent allows the Alpine Bracke to feel the beast from a large distance. Alpine Bracke is a dog, which is adapted to the severe conditions of mountain hunting grounds, this drives the beast calmly and slowly, with a fine voice. A dog of medium height, unpretentious, highly durable, with good sense and innate aggression for the beast. Currently, it is successfully used for hunting hare and fox. To work on a blood trail this dog is held on a leash. In addition the Alpine Dachsbracke is retrieving the fowl very well. Resistant and combative on the hunt, the Alpine Dachsbracke is affectionate and exceptionally devoted to his owner. This persistent and mobile dog is possessing the great endurance. The Alpine Dachsbracke has a good voice and a keen sense of smell. With this dog you can hunt rabbits, foxes, wild boars, as well as the birds in the heavy mountain conditions. The Alpine Dachsbracke need a firm but patient training. He requires space and exercises. You should regularly clean this dog with the hair brush. The breed is officially recognized as a hound on a blood trail, although it is closely related to a group of Bracke (dogs, that are usually used for chasing the game) so, the Alpine Dachsbracke is a "multi-hunting" dog. He is confidently finding a game after the shot, and usually this dogs are used for work on a blood trail of a hoofed animals. The Alpine Dachsbracke is going with a voice on the trail, chases and stops the game, which makes it easies to monitor the process of hunting. Alpine Dachsbracke is very well chasing the game in the woods, having a certain sharpness in relation to wild animals, and sometimes also to people, so only the rangers and experienced hunters should keep this dog, because they are able to use it in accordance with it's natural instincts and abilities. Unlike many other hunting dogs, the Alpine Dachsbracke during the exam is also tested for the willingness to protect and guard. The Alpine Dahsbracke has a spirited disposition, he is generally decent with people, in the house he is nice and watchful companion. This dogs have a powerful bone structure and they are strongly muscled. In Germany, for example, this breed is quite rare, the Alpine Dachsbracke are bred exclusively for hunting. This dogs are suitable for hunters, with regular opportunities to use them for hunting and to ensure, that their minds will be busy all the time. Despite that fact that this dog is a good companion, quite gentle and friendly, it is better not to keep the Alpine Dachsbracke in the house. This is a dog for rangers and true hunters. Health problems: Generally the Alpine Dachsbracke is a very healthy breed.